For the second year in a row I have been asked to serve as a “celebrity” judge in the Diocese of Maryland’s All God’s Peeps contest. 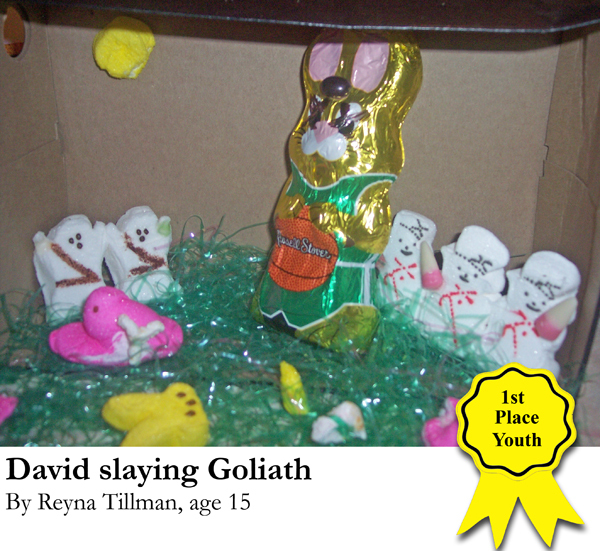 I am judging an amazing array of Peep-themed Biblical dioramas in a variety of categories. And, as I reflect upon this weighty assignment, I realize that this ministry really defines my priesthood. It is the view from the Judgment Seat of Peepdom that offers me a stunning vista of God’s mercy and grace. Or at least a large dose of Yellow #5. Being a celebrity judge is harder than it sounds. First, the pressure is enormous. People are constantly trying to sway my vote by bribing me with stale Easter candy. Plus I get recognized a lot in public which is an annoyance but also the price of fame. Okay, they clearly have a loose definition of “celebrity” in Maryland but it’s the only time of year I can claim celebrity status. Look for me in a tabloid at the grocery store; I’ll be the one trying to adopt one of Angelina Jolie’s children. The Rev. Canon Mary Glasspool, Bishop Suffragan-elect of the Diocese of Los Angeles, and the two bishops of Maryland make up the rest of the Peep judging panel. So it is an august group. I wonder if they also don long white wigs when they judge the photos? That’s how they arrive, by the way. I get a host of e-mails with pictures of the dioramas attached. I’m surprised my computer didn’t crash this year (and a word to the wise for future contestants..stop with the Noah’s Ark dioramas already!). All God’s Peeps is the brainchild of Sharon Tillman, Communications Director extraordinaire in the Diocese of Maryland. It’s even officially sanctioned by Just Born, the makers of Peeps, so it’s all above board as long as they use the little trademark logo after the word “Peeps.” I’d use it myself but I can’t find it on my computer. So sue me. Anyway, the results will be announced at this weekend’s diocesan convention. Which means two things: the tension is mounting and my celebrity status is about to be revoked. I so very proud of you. Hope you’ve voted down anything using anything other than YELLOW peeps.